Barefoot Hiking Tips & Benefits - All You Need To Know! Home Hiking & Backpacking Barefoot Hiking Tips & Benefits – All You Need To Know! 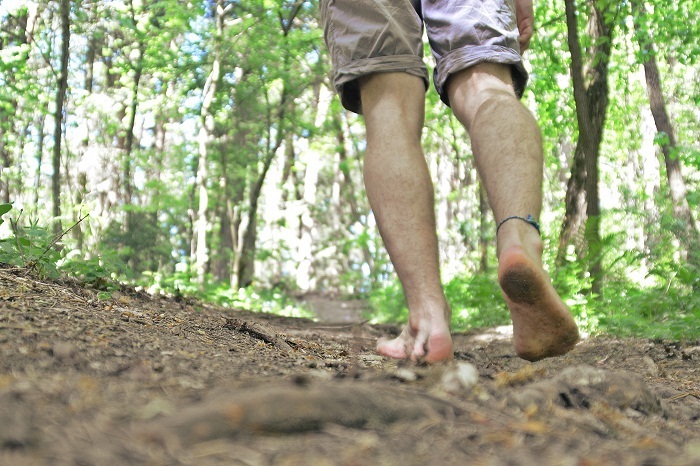 Barefoot hiking has generated quite a buzz among outdoor enthusiasts lately. Some hikers quickly became smitten with this unusual trend of hiking, while others expressed doubt and disapproval of going completely shoeless. 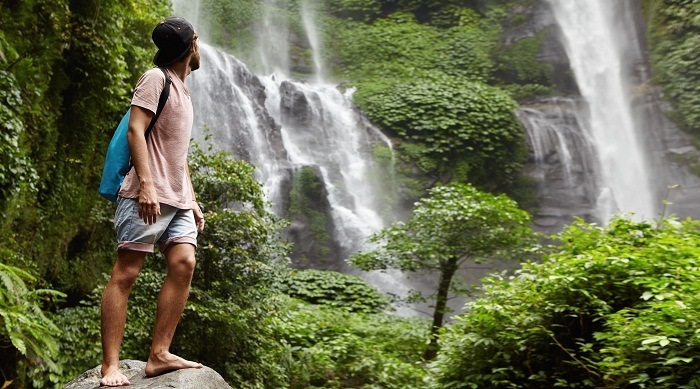 Although barefoot hiking remains a debatable topic in the community of hiking lovers, its appeal is still undeniable, as seen in the growing number of hikers who switch to barefoot hiking. 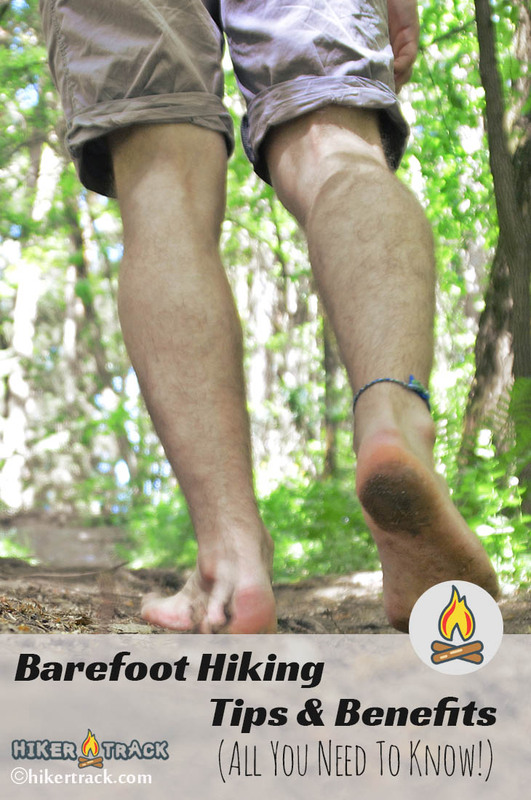 So what is barefoot hiking? Are there any benefits associated with hiking without any footwear? If you are interested in giving barefoot hiking a try but still a little hesitant, check out our comprehensive guide on barefoot hiking below. We will walk you through everything you need to know about barefoot hiking so that you can confidently make up your mind on whether to hike with or without your beloved shoes. As the name suggests itself, barefoot hiking refers to the way people hike in the most minimal form – with their feet only, free from any kind of footwear and even socks. Hiking with no footwear at all does sound like a dreadful thing for a lot of us, but it is absolutely feasible and worth trying. In fact, humans used to walk with their bare feet for thousands of years before the introduction of footwear. Our feet are made for walking, aren’t they? So why can’t we run or hike with only our feet? Isn’t that the natural way? It is easy to cringe at the idea of taking off your shoes and trekking into the wild, especially when most of us are used to wearing shoes or boots or other kinds of footwear. Without them, we would feel unprotected. 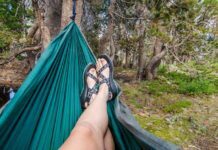 I, too, used to think of barefoot hiking as an insane idea, but once you get to know the benefits of barefoot hiking plus all the essential barefoot hiking tips and tricks, you may think twice about it. First, let’s explore all of the barefoot hiking benefits. To be fair, barefoot hiking does bring about plenty of benefits for hikers. The easiest benefit we can notice is barefoot hiking is a lot more environmentally friendly. When you hike with your bare feet, you will hardly cause any erosion along the trail, as opposed to all the imprints you possibly leave when you wear your hiking boots or shoes. The second benefit of trying to hike with your bare feet is an opportunity to strengthen your muscles. Without any shoes or boots, your feet will get to do all the work. Plus, hiking barefooted can be better for your joints. You’ll be surprised at how tough your feet are and what they are capable of conquering, as long as you give them a chance. Thirdly, barefoot hiking can give you an edge when you hike along a muddy or slippery trail. No matter how advanced your hiking shoes are, your feet stand a much better chance of clinging and helping you maintain your balance while crossing slipper or rocky terrains. Why? Because your feet are naturally clingier and more tactile than any pair of hiking shoes, you ever own. Fourthly, going barefooted gives you a unique opportunity to actually feel the earth underneath. You will be truly close to nature while being able to embrace the feelings of leaves or soil below you. Isn’t it a memorable backpacking experience? The next benefit that barefoot hiking can promise you is a chance to develop your bodily senses and refresh your health. Your feet will get to interact with the earth, and it will not only strengthen your feet but improve your overall health as a result. Last but not least, when you become better at barefoot hiking, you can save quite a few bucks on expensive yet unnecessary hiking shoes. This will be a relief to those who love minimalist hiking. 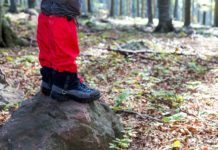 However, as appealing as barefoot hiking sounds, there are indeed a couple of drawbacks that every hiker should be aware of before attempting to try barefoot hiking. Apart from many of its amazing benefits, barefoot hiking does pose some risks to hikers. The first and also the most obvious limitation of barefoot hiking is the complete exposure to dirt and germs and possible infection. Be prepared for really, really dirty feet, and this can be a major turn-off for those who prefer hygiene and cleanliness. In addition to getting dirty, your feet will be completely unprotected. They may even sustain unwanted injuries, as it’s normal for your feet to get hurt or stubbed along the way. Thus, hikers must be extra careful of what’s underneath their feet. Also, it is going to be much more challenging for barefoot hikers when they travel in situations of unfavorable weather. Another drawback that you should consider is that your feet need time to adapt. In other words, if you are used to wearing shoes or sandals, you’ll need to be prepared for lots of foot pain when you first try barefoot hiking. Your toes and the soles of your feet will get really sore, and at some point, along the way, you may feel like giving up. But there will be no gain without pain, right? With all of its pros and cons listed above, it is safe to say that barefoot hiking should never be attempted without proper preparation. The more you are prepared, the more likely you are to succeed. Anyone can try hiking barefooted, as long as they keep in mind the following barefoot hiking tips. Both you and your feet need time and lots of practice in order to become a barefoot hiker. Take it easy and take it slow. Try walking short distances with your bare feet to familiarize yourself with the feeling. You can try walking around your garden, or around a park. Try it for a day to see how your feet feel afterward. Set realistic goals instead of trying to push your feet over their limits to prevent injuries. It is wise to give your feet plenty of practice through walking or running on different textures and terrains. Start first with a hard surface. Increase the mileage gradually. Practice makes perfect, and who knows, you may be able to even try a barefoot thru hike like a pro. See more: What Is Thru-Hiking? This one sounds obvious, but not everyone knows how to take care of their feet properly. After each practice session, wash your feet thoroughly and give them a real treat such as a massage. Trust me; they deserve it. You should also always include first aid kits in your belongings to care for your feet when needed. Even the toughest barefoot hikers can suffer from cuts or wounds along the way. When you try walking or hiking barefooted, it is important always to avoid shuffling or dragging your feet along the path because otherwise your feet will be more vulnerable to cuts and injuries from pointy or obstructing objects on the trail. It’s also necessary to remain wary of your surroundings and always watch where you are going. To avoid tiring out your feet, always try to keep your weight on the balls of your feet and not your heels. That way you will be able to move smoothly with less pressure on your feet. The above tips will be able to help you prepare for barefoot hiking successfully, but how about hiking in extreme weather? Is barefoot hiking even possible during winter? And how can you prepare for that? The thought of standing barefoot outside in the cold weather is intimidating enough, let alone hiking barefooted in winter. However, as long as you are prepared, barefoot hiking winter is totally possible. The trick is simple. In order to hike with just your feet in winter, you’ll need to enhance the strength and tolerance of the feet to low temperatures. 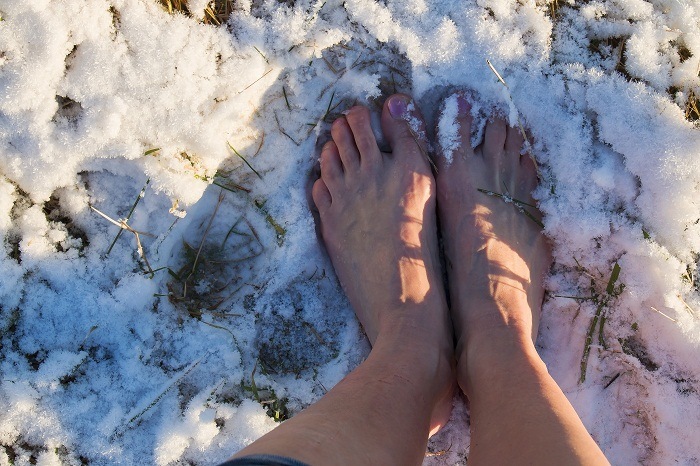 Give your feet time to get used to increasingly colder temperatures to help them adapt. It may take months before your feet become ready for the winter journey. When you start your hike, remember to keep yourself as warm as you can - try wearing thick insulated clothing, a hat, and insulated leggings or pants. Should you hike barefoot or not? On the whole, barefoot hiking is no different from other types of hiking. It requires careful preparation and loads of practice, but at the same time, it offers rewarding experiences and plenty of benefits. 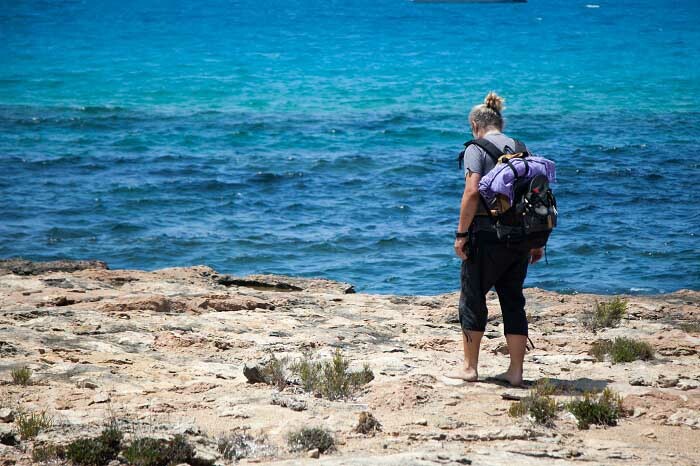 Barefoot hiking may not be the right choice for fainthearted travelers, but if you are among those who seek a true connection with Nature, you should definitely give barefoot hiking a try. It’s an alternative way to see and feel the world like you have never seen and felt it before. 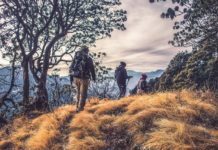 While some people are still doubtful about barefoot hiking, with the right tools and preparation, you’ll find out that barefoot hiking is not as hard as it seems. Through your engagement with barefoot hiking, you may even realize a new side of you and the formidable power of your feet. Previous articleKeen Vs Merrell: Which Is A Better Choice? I love being barefoot so can immediately see the appeal of hiking sans footwear. Although I’m not too sure about doing that in the snow. Brrrrr!